How Do You Spell SNIDER? Correct spelling for the English word "Snider" is [snˈa͡ɪdə], [snˈa‍ɪdə], [s_n_ˈaɪ_d_ə]] (IPA phonetic alphabet). 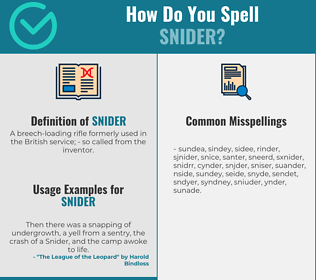 Below is the list of 200 misspellings for the word "snider". A breech-loading rifle formerly used in the British service; - so called from the inventor.